Lelo in Nopo: Hot links! No, not sausages and hot dogs. Links to great things I've come across in the webdom that I think you might like too. Here's a great piece about the science of soil and how its make-up makes us happy. But haven't all gardeners kinda known this? Well now science is catching up with us. More for the gardener....check out this great made-from-recycled window frames coldframe. What a great piece to grow early edibles for the garden, no? Oh Portlandia, Portlandia. Such a funny show that's hitting some funny bones a bit too hard in this town. I think it's hilarious, and true. Here's a great interview about Portland's food culture with Portlandia star Carrie Brownstein. You should read it. I recently did an interview with Marilyn over at La Salonniere—Interviews for the Creatively Curious. This was the first time I'd been interviewed holistically, including my professional life, my domestic arts life, blogging life, and she even included Wink. It was fun to answer her great questions. You can check out my interview here but make sure to check out the other great people she's interviewed. I'm humbled to be among such great folks. Allison has such a lovely blog, and her recent post about Portland's faux spring and the game we play with it every year soooo resonates with me. And I swoon over her photography. You will too. How much do I love this? Proud Multnomah County Library card holders taken at my favorite, local neighborhood branch. I love my library, and obviously, so do they. What great photos! I would much rather lose my driver's license than my library card! I love it! The girls love theirs too. Yeah, definitely love the library card candids. I have a bookmark with a bunch of local libe lovers on it. 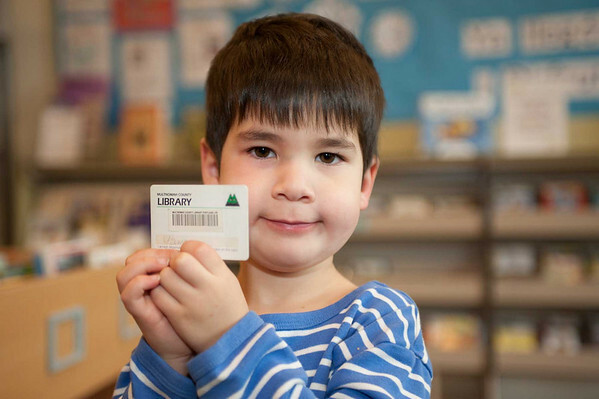 There are many reasons the Multnomah County Library system is ranked as among the best (maybe even THE BEST) in the country. Marilyn is Great! I didn't know she'd interviewed you. Will have to check it out.